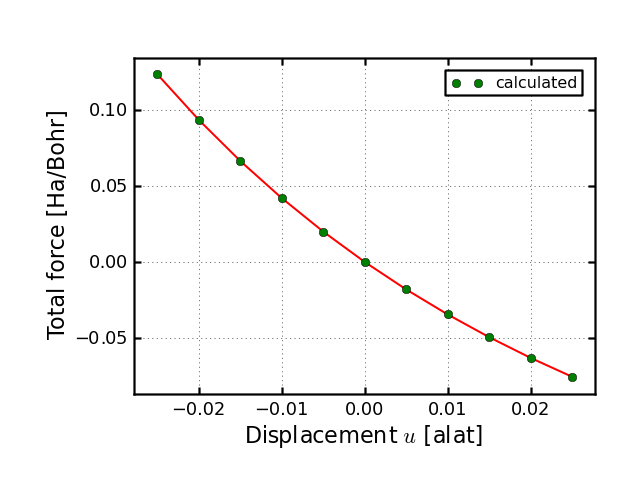 PLOT-totforce.py: Python visualization tool for the force-vs-displacement curves. In order to generate input files for a series of different structure you have to run the script SETUP-diamond-phonon-g.py. Notice that the script SETUP-diamond-phonon-g.py always generates a working directory containing input files for different atomic displacements. Results of the current calculations will be also stored in the working directory. The directory name (in this example gamma-1) can be specified by adding the name in the command line. To execute the series of calculation with input files created by SETUP-diamond-phonon-g.py you have to run the script EXECUTE-diamond-phonon-g.sh. If a name for the working directory has been specified, then you must give it here, too. The script PLOT-checkderiv.py is executed as follows. 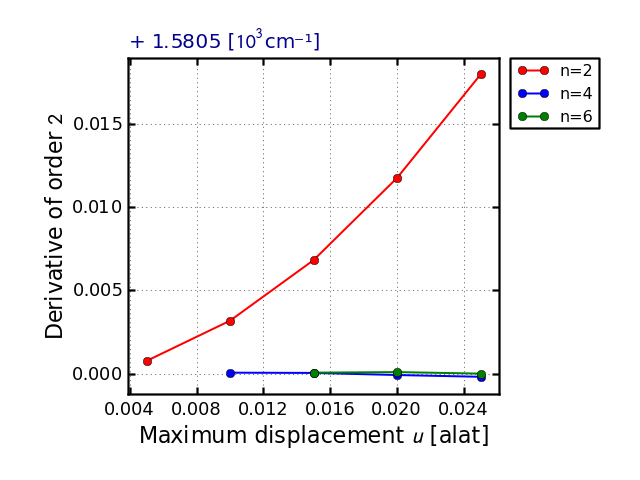 The previous plots can be used to determine the best range of displacements and order of polynomial fit. 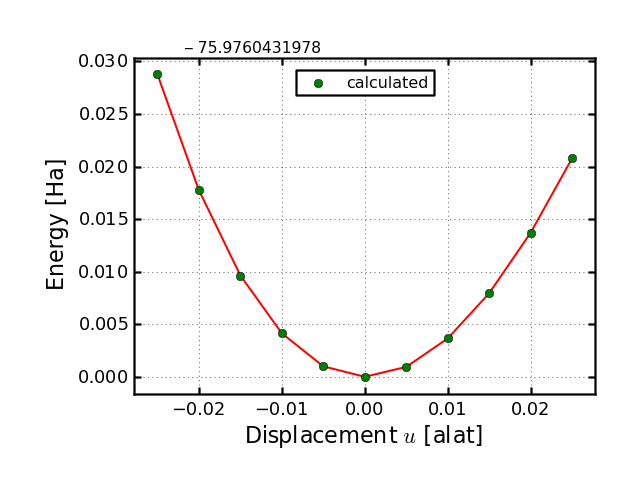 By analyzing the plot, we note that curves corresponding to the higher order of the polynomial used in the fit show a horizontal plateau at about 1580 cm-1. This can be assumed to be the converged value for the second derivative, from the point of view of the fit (see the analogue case in Energy vs. strain calculations). 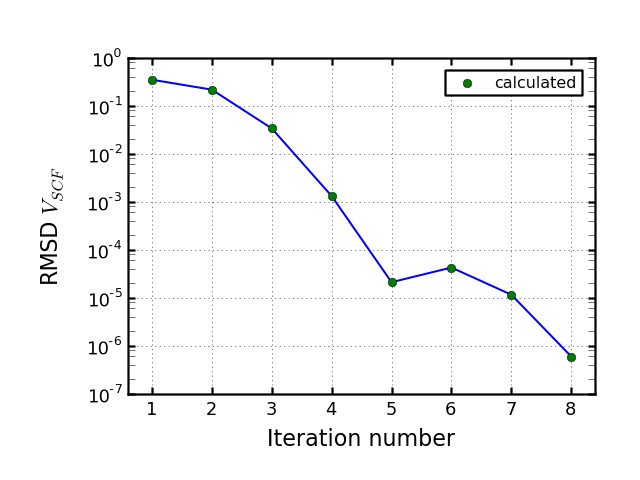 NOTICE that, in this example, the values which are given above as output on the screen are not directly the actual second derivative of the energy-vs-displacement curves, but the values of the frequency, i.e., combinations involving the square root of the derivative (see Section 7. for the explanation). Here, the entry on the command line, (LABEL), must be specified and represents the label (i.e., the name of the working directory) for which you would like to follow the RMS deviation for each iteration. In particular, the choice r refers to the currently running calculation and, more generally, LABEL to the calculation already saved in the directory LABEL. An example of the PostScript output of the script is the following.